Windows XP doesn’t detect “old-skool” parallel-port printers? Here’s a helpful tip. Its a great little computer! I have really had fun with it over the past couple of months – it brought back the same fun that I had in the early 80’s with the TRS-80!! Thank you for your site – your technical advice has been fantastic! I bought one of the original (non-Meso) Sylvania G netbooks about a month ago, for a 6 month trip to Mexico. As of this point in time it has been a poor experience. 1) The wireless only works for 5 minutes at a time (then I must restart and try again). 2) Any time I use the command prompt my computer freezes (a black square pops up and the computer doesn’t respond. I just tried to open xterm to remove the dock at the bottom of the screen and it froze. 3) When I scroll through an open office file, the screen gets really blocky and only scrolls with the bottom inch os the screen. You need to contact Digital Gadgets, the makers of the G netbooks, and get it fixed. It’s under warranty, and you should not be having those kinds of problems from a brand new netbook. There is clearly something wrong on the hardware level. It seems that this little netbook really doesn’t play well with Linux, but it absolutely loves windows. I bought one of these off of ebay a short while ago, for like 150 bucks. I am quite surprised at the things functionality, at least in windows. The thing seems to run dog slow under linux, due to the CPU frequency not being utilized properly. I think it requires a kernel update to fix that, else it runs at a fixed 600mhz. The wireless is very poor under linux. And I get more frequent lockups. None of that can be said about running the thing with windows though. I suggest digging around for the latest windows drivers and building a new install CD using Nlite. The problem with Linux is that many distros don’t come with “cpufreq” enabled by default. Those that do rarely have VIA C7 power management enabled, though cpufreq’s ACPI P-state power management works with the C7 just as well. The CPU supports eight frequencies, from 400 to 1200 MHz in 100 MHz steps. If the system is idle, you can expect to get CPU frequency reports that are always at a low number (the 600 MHz you mention, for example). If ACPI or C7 frequency management are not enabled, I think the netbook locks at 600 MHz by default for power saving purposes. Windows uses ACPI P-states, so Windows will almost always work okay with this CPU. BE SURE to follow my advice from a prior post when using Windows though: “Edit C:BOOT.INI and add the /usepmtimer switch to the boot command line for Windows XP.” There are timing problems with 2000/XP and this netbook if you don’t enable the power management timer in this way. The Linux that comes with the G is very poor, in my opinion. It locks up and has practically no apps with icons; it’s too “cloud-centric.” Installing Debian on it instead of gOS might be a very VERY good idea. It’s not Linux that’s at fault, it’s the poor quality of the Linux distribution chosen as the shipping OS. If you run Linux *or* Windows on it, I highly advise turning off paging/swap entirely. The 3600 RPM hard drive is extremely slow, but by killing paging you’ll stop using it as virtual memory and the generous 1GB of RAM will act as a very nice disk cache. Firefox, for example, is slow to start the first time but every subsequent start is super fast. What is the best way to get on the internet for the g netbook? What do I need to buy? Cloudbook is probably a computer ahead of its software. Ubuntu 9.04 Jaunty Jackalope ease off slow harddisk and wifi low power problem (as Jaunty is using linux kernel 2.6.28). Oh, btw, cpufreq can be backported manually with instructions from http://www.a110wiki.de (CPU section). Don’t forget to raise minimum frequncy too from 400MHz to at least 550Mhz, Cloudbook may randomly freeze without it. If you literally mean a password that comes up before the operating system even tries to start, I can’t help with that at all. If you’ve forgotten your password to your user account, you can easily recover it with an external CD-ROM drive and a Linux CD. The wireless LAN is a Realtek USB wireless chip, I think RTL8187B. You can go to http://www.realtek.com.tw and download the latest RTL8187B driver for it. I don’t use the hotkeys, but the drivers provided on the Sylvania site should work. Let me know if you can’t get them and I’ll fish up a direct download for you. call digital gadgets about the system password issue. I have the sylvania g netbook and I am playing around with eclipse and the android sdk and plugin for eclipse. I connect a larger monitor on the side of the netbook and hit fn+f3 and it works pretty well. It would be nice if I could change the resolution of the screen when I switch to the vga monitor. Does anyone have an indea of how to do that in gOS? Thanks all– this is very good information. How do yo install windows xp onto this little netbook, I know you have to install with a usb flash, but how do get to the boot menu, is there a boot menu? I have BIOS set to boot off the USB but nothing happens when i startup. any help would be appreciated. I cheated by using Linux to drop a snapshot of Windows onto the netbook. The boot menu is either F10 or F12 (probably F12) and you can also go into the BIOS setup to change boot devices and order (with the drive plugged in, of course). There are guides on how to install Windows via USB out there for other netbooks; the same steps apply to this one as well. Go to http://c02ware.com/tss.php and grab the latest Tritech Service System (for USB), unpack it to the USB drive on another Windows machine, and run boot/bootinst.bat to make the flash drive bootable. See if you can boot TSS from that flash drive, and if that works, you’ve got USB boot capability working. If you have a legal license for Windows XP for this machine, email me at jody@nctritech.com directly once you get TSS to boot and I’ll help you image the machine with the XP version you’re licensed for directly over the Internet. It will take a few hours but it will work. 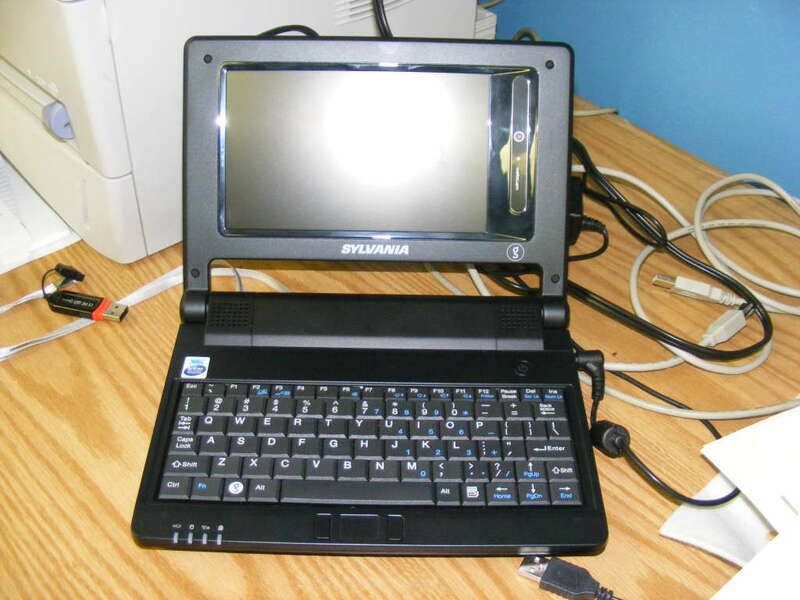 I recieved a newer Sylvania 7″ Netbook using Windows CE for Christmas. I do not have a home computer. My netbook will connect to wireless hotspots and/or my neighbors wireless networks however, even as it is connected to these networks it will not use the internet! It says that no page can be displayed,the server cannot be found and that there could be a DNS Error. I love that it is portable but it is no help to me, a college student, without the internet. I didn’t know about these netbooks but they are not the same as the Sylvania G 7″ netbook. I will post an update to reflect the appearance of this new netbook. Netbooks ROCK! I have an Aspire One. Atom 1.66Ghz, 1 gig ram. 160HD. I run PS CS5, MS Office, watch movies, listen to music, download tons. This is one of the greatest computers I have ever bought. Does EVERYTHING I throw at it. You netbook haters are all messed in the head. I’m from Germany and get my Sylvania Netbook in September 2008 in New York. First I use this sometimes. Later it was always unused. Now I try/ play again. Because I can’t update the GOS with ubuntu 8.04 version and can’t remove this, I download on a other laptop the ubuntu 10.04 and a programm, fix then the version 10.04 on a usb device. I like create/ install ubuntu 10.04 from the usb device. For this reason I need my bios password for the Sylvania netbook, to change the starting options! Here is no service for Sylvania. Standart passwords like BIOS, PHOENIX, phoenix … doesn’t work. To take out the cmos battery I like avoid. Other ideas/ standart passworts for the bios? Help please!